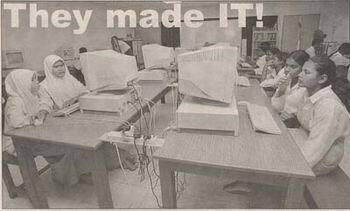 iSchool Portal » New Straits Times – They Made IT! New Straits Times – They Made IT! TIONG Ting Ming is probably the best thing that has ever happened to sekolah menengah jenis kerbangsaan Dindings in pundut, Perak. In less than five years, the 49year-old principal has done the near impossible.He has successfully turned a run-down school into one of the countryâ€™s celebrated and enviable cyberschools. Today, SMJK Dindings has the information technology equipment and sponsorship that other school can only wish for. Mimos Berhad provided the school with 32 fixed Internet Protocol (IP) addresses, fixed IP and a leased line which enable students and staff to access the web server from anywhere in the country. Just last year, networking giant 3Com Corp sponsored a Wireless Ethernet system (802.11b) worth RM20,000, allowing notebook users to surf the Net hooking up to a telephone line. Given all this, IT has undoubtedly become part or the schoolâ€™s culture. Tiongâ€™s philosophy is simple. Everyone has to be IT-savvy, be they students, teachers or janitors. â€œTherefore, for four periods a week, students attend IT classes where they learn to assemble computer parts and master complex programming software like C language,â€ he says. Just like the students, the entire school staff too is made to attend IT classes. The teachers are encouraged to incorporate what they have learnt in their teacher. Now, Power Point presentations substitute the chalk-and-talk method and homework for students is posted on the teachersâ€™ self-create websites. â€œIn order to embrace IT, one must turn it into a lifestyle,â€ Tiong says. He believes that schools should give students full access to the facilities and the complete trust to handle the technology responsibly. â€œYou canâ€™t expect them to develop their fullest potential in IT when they can only use the facilities for a limited amount of time,â€ he adds, alluding to schools which limit studentsâ€™ access to computer facilities for fear they will damage the expensive items. Tiong says that mistakes will happen, but teacher should view them as part of a learning process. Therefore, students of SMJK Dindings are allowed to use the facilities anytime they like, including after school. As a result, the students are able to design their own websites, burn CD-ROMs, download MP3 files and take pictures using digital cameras using the facilities at school. In fact, the schoolâ€™s website is maintained by the students. Yet nine years ago, the school was literally falling apart. 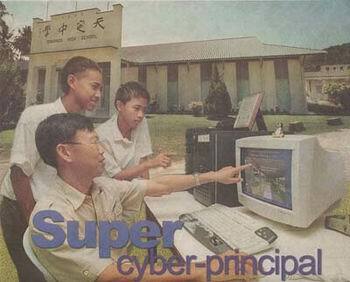 It was in 1992 when Tiong first set foot in the school. 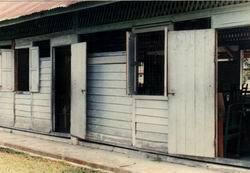 Small and secluded, it consisted of only three battered single-storey blocks. The student population was 320 and dropping. Most of the students were more eager to land a job that stay in school did not have enough students to fill the From Four and From Five classes. 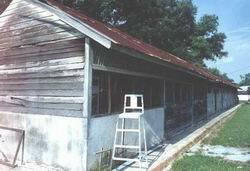 But Tiong saw it as a challenge to transform the school into what it is today. He believed that a motivating environment will keep the students in students in school. And the lure of cybercafes, which were beginning to exert its influence among the young then, set him thinking. â€œWhy do kids like to frequent cybercafes?â€ he asks. The answer, Ting says, is the environment and youthsâ€™ innate interest in all things new two-storey block in 1995 was the pivotal event to the schoolâ€™s wondrous transformation into a Smart School. Tiong wanted it to be equipped with the latest telecommunications infrastructure. To realize this ambition, fundraising events were held at the school. Tiong traveled long distances, swallowed his pride and knocked on the doors of doors offices to ask for sponsorship. With the little money that the school raised, Tiong made bus trips to Singapore to try computer parts to repair old PCs. But his perseverance has paid off. The generous sponsorship from various companies that Tiong secured means he does not have to travel so much, allowing him to concentrate on work at school. He still buys computer parts but he does it the IT way now, from the auction website Ebay.com. â€œI just carried out transaction with someone from Cincinnati, United States this morning .I can get computer parts much cheaper get computer parts much cheaper this way,â€ he says. The number of students has also increased. The student population is now just a little over 800. Students no longer flee from the school â€“ they actually apply to be accepted. Despite being a self-professed â€œscienceâ€ person, Tiong had little qualms about removing Biology from the school syllabus and replace it with IT. An unorthodox move indeed, but the principal feels that he has given the students a better alternative. Parents and students seem to agree with him because SMJK Dindings has not lost any students due his firm stance. In fact, it is the rival schools who are their students to SMJK Dindings. Now they too have introduced IT in their schools to avoid students â€œmigrationâ€. But before more parents start clamouring to register their children with SMJK Dindings, the coveted school wants to make one things clear. It may be the best Smart School around , but it is not the best in overall academic excellence. Tiong says: â€œwe are average performance-wise. Although we have the facilities, it is unfair to equate the amount of investment we have put into this project with the studentsâ€™ performanceâ€. A believer of lifelong learning, he is not so concerned about academic performance. He is in more proud of the fact that his students have evolved from self-conscious kampong kids into confident, independent and responsible citizens. Having only six more years before retirement, Tiong is not too sure if he want to leave quite so early . But when the time comes, Tiong hopes that his replacement will be someone who has the same interest and foresight. One thing is certain. The struggle must continues for the sake of the students. Thanks to Tiong, they do now.